Storleken för denna PNG-förhandsvisning av denna SVG-fil: 410 × 478 pixlar. Andra upplösningar: 206 × 240 pixlar | 412 × 480 pixlar | 515 × 600 pixlar | 659 × 768 pixlar | 878 × 1 024 pixlar. 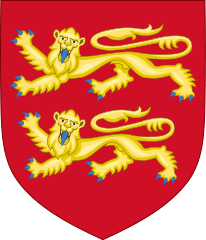 Gules, two lions passant guardant in pale or armed and langued azure, used as the inofficial "coat of arms of Normandy". Coat of arms attributed to "Arms of William the Conqueror (William I of England)"